NETWORK FINALS: The GOLDEN GLOBES adjusted to 5.6, up 0.1 from last year’s final number. In addition, after adjusting for the NFL runover, THE SIMPSONS dropped 1.4 to 3.5, and SON OF ZORN fell 0.5 to 1.8. CABLE HIGHLIGHTS: Bravo’s REAL HOUSEWIVES OF ATLANTA jumped two-tenths from its New Year’s airing to 1.06. Discovery’s ALASKA: THE LAST FRONTIER held at 0.57, and EVEREST RESCUE premiered at 0.26. E!’s GOLDEN GLOBES PRE-SHOW was at 0.57 and its AFTER-PARTY was at 0.17, and for the first time THE ROYALS (up 0.06 to 0.26) outrated its lead-in MARIAH’S WORLD (down 0.01 to 0.25). TLC’s SISTER WIVES rose 0.14 to 0.56, and MARRIED BY MOM & DAD was up 0.03 to 0.16. 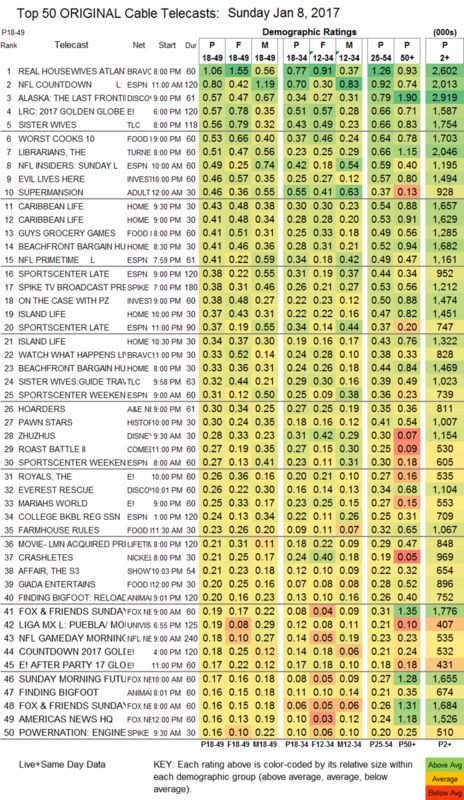 On Food Network, WORST COOKS IN AMERICA ticked up to 0.53, and GUY’S GROCERY GAMES was up 0.07 to 0.41. 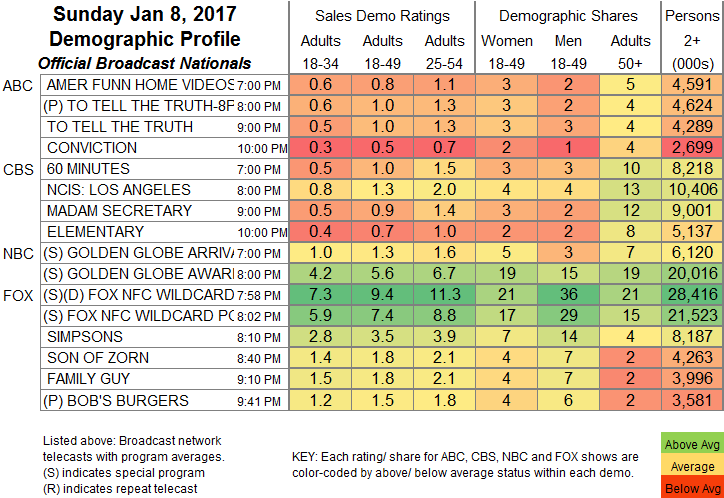 TNT’s THE LIBRARIANS gained 0.06 to 0.51. ID’s EVIL LIVES HERE climbed 0.11 to 0.46. A&E’s HOARDERS was at 0.30. History appears to have aired an off-night new episode of PAWN STARS at 0.30. Showtime’s newly-renewed THE AFFAIR rose 0.08 to 0.21, still without an original lead-in as it waits for HOMELAND to return.